At the end of the nineteenth century, it was understood that product design, for lack of a better term, needed to be “reformed.” The first salvo was from William Morris (1843-1896) and the Arts and Crafts Movement he headed in England, followed by the Aesthetic Movement. The use of the term “aesthetic” needs to be clarified by stating that, at the time, the movement was named, the meaning referred to be belief of the artist, designers and consumers that ordinary utilitarian domestic life should be beautiful and the home should be like a work of art. However, properly speaking, the word “aesthetic” refers to the philosophy of art or the reason for art, or the purpose of art or the epistemology of art—-the very definition of art itself. For Emmanuel Kant (1724-1804), who established the field of aesthetics in philosophy, the purpose of art was that it had no purpose. Art existed in its own right and was divorced from utility and worldly purpose. For Kant, the proper role of art was to be beautiful, i. e., useless except to exist as an object of appreciation. The late eighteenth century understood beauty to be the ancient Greek expression of classicism, which was, in turn, the accepted epitome of beauty. Today, the Kantian basis for art still holds–the purpose of art is that it has no purpose other than art’s purpose, but we rarely consider “beauty” as the sole consideration. In the twentieth century, the definition of art stretched beyond beauty to the point of abandoning beauty, but in the nineteenth century, beauty remained the criteria and what the Aesthetic Movement stretched was the ideal of beauty to the applied arts. 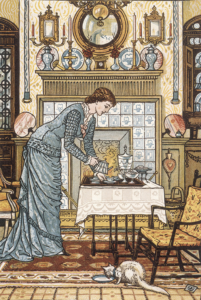 Frontispiece to Clarence Cook, The House Beautiful: Essays on beds and tables, stools and candlesticks, 1878. The Aesthetic Movement was fundamentally distinct from the Arts and Crafts Movement. For William Morris, the way to “reform” design ruined by mass-production and machine manufacture was to return to the past and reunite art and craft. As Morris said, “The past is not dead, it is living in us, and will be alive in the future, which we are now helping to make.” He advocated returning to the values of the past and the respect for craft and the work of the artist in order to reform the decline in interior design brought on by the machine. Through Morris and Company and the artists William Morris employed in his enterprise alternatives were made available in wallpaper, fabrics, and furnishings to a refined public. The larger public had to be educated and the idea of applying aesthetics to the home needed to be explained to consumers. One of the leading advocates of Aestheticism in interior design was an English poet and playwright, Oscar Wilde (1854-1900). Wilde, as was discussed in the previous post, did extensive lectures at the end of the nineteenth century to mainstream audiences, especially women, explaining the basic tenets of “good taste.” During his American tour, he began to use the term “house beautiful,” perhaps inspired by an American magazine launched about the same time as his lecture tour, The House Beautiful (1881). 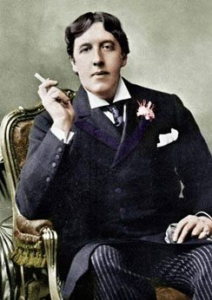 Wilde was aware of the resistance of the general public to anything new and unfamiliar. He complained, “A fresh mode of Beauty is absolutely distasteful to them, and whenever it appears they get so angry and bewildered that they always use two stupid expressions—one is that the work of art is grossly unintelligible; the other, that the work of art is grossly immoral. What they mean by these words seems to me to be this. When they say a work is grossly unintelligible, they mean that the artist has said or made a beautiful thing that is new; when they describe a work as grossly immoral, they mean that the artist has said or made a beautiful thing that is true.” However, due to the presence of Wilde, a flamboyant performer, there was an (unexpressed) homophobic backlash against the aesthetic attentions lavished on interior design and the Aesthetic movement became a subject of mockery. Writing in 1986, Stein presented some important points. Despite the fact that the Aesthetic movement took place at the end of the nineteenth century, it was essentially a historicizing movement that valued eclecticism or a mixture of motifs and cultures and times. In addition, it was narrowly focused upon the home, home decor, home furnishings, coupled with the rather vague and water-down social hopes for an improved citizenry. The Aesthetic Movement was a palliative for women, who were demanding the right to vote and to participate in public life. If they could be corralled into being diverted as consumers of new goods or if they could be redirected towards art schools, then they could be gently led into acceptable and enjoyable territories. As it turned out, no matter how attractive the household goods, women would continue to insist on voting, but they would take advantage of art schools and become professional artists in their own right. At this point, it is necessary to make two main points: in the fin-de-siècle period, reform was in the air as was a dawning awareness of a new century looming. And there was a brewing battle between beauty and rationalism, between art and functionalism, a battle that would be won in the twentieth century in fits and starts. In some cases, the careers of certain artists of the Aesthetic movement–this chapter uses Christopher Dresser (1834-1904) and Charles Rennie Mackintosh (1868-1928) as examples–were torn, perhaps not consciously between the past and the present. For these designers, it can be said that they also wished to “reform” the machine in the sense that they designed products that could be mass manufactured more or less efficiently but they also never intended to mass manufacture these objects. Both Dresser and Mackintosh created design that were, on one hand, elaborate and decorative, reveling in ornament, and on the other hand, played off the exuberant line with the straight and disciplined line. In this latte sense, these artists glimpsed the future and envisioned a stripped down functionalism borrowed from the machine, which, in the next century, would be recognized as having an aesthetic–an imperative–in its own right. The machine, in the minds of all designers, was a clean and spare functional object that, in most cases, was devoid of decoration, because it had to be. The turn of the century designer will be characterized by this internal schizophrenia, between the period drive to ornament, inspired by history, and the reformist need to simplify, inspired by the machine. To designers, such as Dresser and Charles Rennie Mackintosh in England, there was no question the two—ornament and design—could co-exist. But the “modern” would emerge out of this division or to be more precise, modern design would emerge when the marriage of ornament and design could no longer coexist. Nowhere was the split between past and future acted out more acutely than in the Austro-Hungarian Empire. It was in present day Austria that ornament would be attacked, and it was in Vienna, an old and anachronistic city, that—paradoxically–truly modern design emerged ten years before the Great War. At the turn of the century—the fin-de-siècle—the prevailing style was Art Nouveau, which was a fully synthesized movement encompassing art and design. The importance of Art Nouveau, in contrast to the concurrent fine arts movements, such as Post-Impressionism or Fauvism, was that Art Nouveau, translated as “New Art,” impacted all the arts, fine and applied, as well as the built environment. Art Nouveau, famously named after a shop in Paris, Maison l’Art Nouveau, opened by Siegfried Bing (1838-1905) in 1895, set the standard for design as art for a new century. Art Nouveau designs were scaled up to architecture and down to jewelry, translated into illustrations and interpreted as posters. From the opening of Bing’s establishment, the movement in applied arts dominated the early years of the twentieth century, acquiring different names from nation to nation: Jungenstil in German speaking countries, the Liberty style in England, and Arts and Crafts in America. As an update to the design reforms William Morris in Great Britain and as an antidote to the beloved Biedermeier in Germany, Art Nouveau seemed to threaten 19th century historical eclecticism in architecture with, as its name implied, something new. But Art Nouveau, we might argue, was not specifically modern as “modern” would come to be understood. Art Nouveau reveled in nature and the exuberant rhythms of natural growth, and therefore this design style was disconnected from a modern world that was on the verge of a technological revolution, driven by the new god of the era—the machine. The Machine, a word which was often capitalized by the early 20th century, loomed over everything, from communication to travel to household conveniences, forced or inspired a new field, industrial design. The term “industrial design” would become more familiar after the Great War when being an “industrial designer” became a separate occupation, but for centuries, the designer of machines had existed. Actual people, probably engineers or their precursors, built machines without signifying labels. However, in the twentieth century, the industrial designer, who worked directly with machines, had become recognized as a separate occupation, distinct from those who built the actual machines, and were considered vital to technological progress in a modern society. But all of these pre-modern and modern ideas had foundations that were built during the two decades preceding the turn of the century. In terms of longevity, like most of the art movements of the early twentieth century, Art Nouveau was brief, ended with finality by the Great War. But its main ideas lived on. The concept of reform, inspired by the horrors of manufactured decoration, continued after the War and were manifested by the work of the Bauhaus architects and by the Swiss architect, Le Corbusier. The concept of the total work was also continued by these very same architects, resulting in a complete redesign of exteriors and interiors and home furnishings during the 1920s. At the Bauhaus Walter Gropius reinstated the medieval ideals of William Morris and the hand made ethos of the Arts and Crafts movement until he abandoned the idea of unity of arts an crafts for the unity of arts and industry in 1923. The modern movement also kept the Art Nouveau concept of the building or the piece of jewelry as something unique and precious, aloof and complete within itself, ignoring the environment that surrounded it. One could examine the intricacies of a Mucha poster and become lost in its details, while, in contrast, the villas of Le Corbusier stood alone and proud, works of art in their own right. Art Nouveau was an early twentieth century version of art-for-art’s sake. More than the tragedy of the Great War, Art Nouveau was a victim of its own beauty, its own devotion to expensive materials and its hand made rarity. Infected by the cardinal sin of Victorian design, the curve, Art Nouveau would be superseded by its opposite number, the straight line, introduced by Charles Rennie Mackintosh and Christopher Dresser in England and by Frank Lloyd Wright in America. The story of the straight line is also the philosophy of modern design.